Needless to say, troops tried to improvise whatever means they could to protecting their tanks from the effect of the Panzerfaust’s shaped charges. Extra track, wheels, storage bins, logs and sand bags were attached to the sides and turret in hope of disrupting the jet before it reached the tank’s main armour. 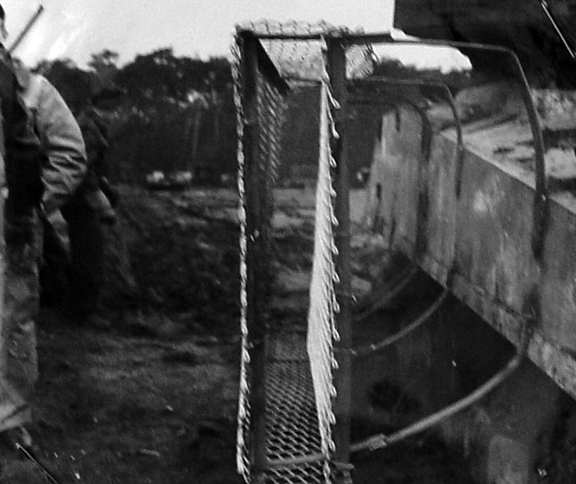 The Russians tired welding wire-mesh frames, and even bed springs, to their tank turrets. In February 1945, First Canadian Army undertook a number of experiments using a derelict Sherman and captured Panzerfaust. These trials were later continued by Canadian Military Headquarters in cooperation with the British Directorate of Tank Design (DTD). 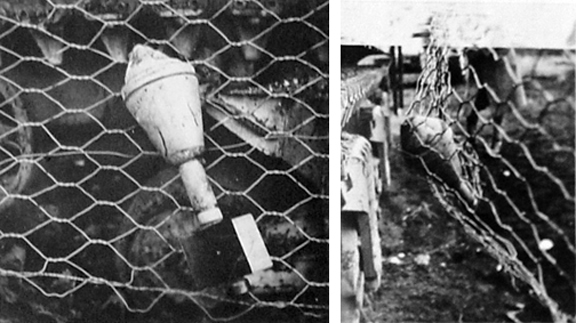 Solutions tested included: spaced armour alone; spaced armour backed by a filler such as cork, rock-wool or sand; angled plates to prevent the shaped charges fuze from working correctly; spikes mounted in plastic armour – the aim was to perforate the shaped charge’s cone as it struck and deform the jet; and mounting mesh screens – the purpose of which was to catch the warhead gently enough to stop it without detonating it. A general view of how the screen protection was fitted for the trial. 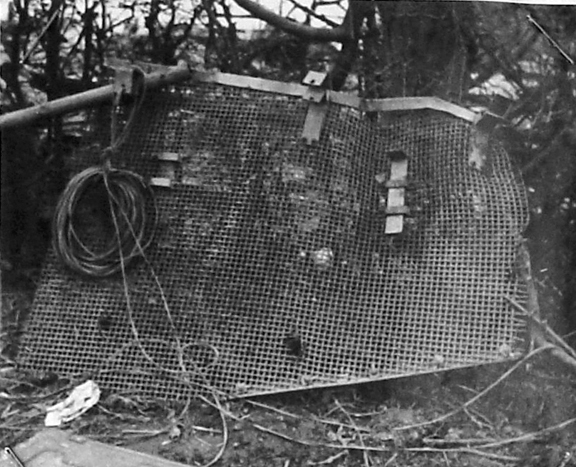 A rear view showing the spacing of the double-meshed screen. Panzerfaust projectile caught up in screen. The final report issued by the DTD on 14 May, 1945 does not make encouraging reading. 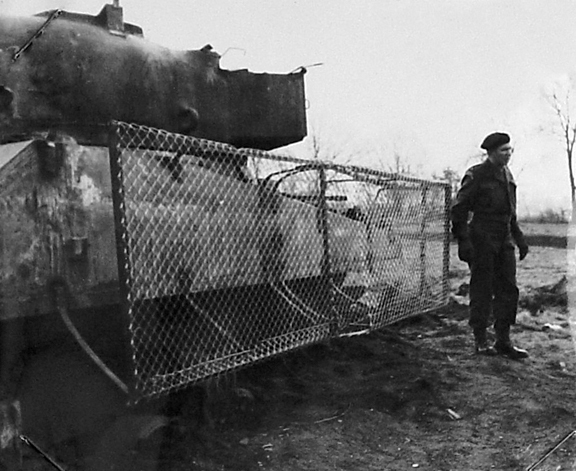 Spaced armour had to be at least 30 inches (75 cm) from the main armour to defeat the shaped charge – increasing the overall width of the vehicle by 5 feet (1.5 metres). 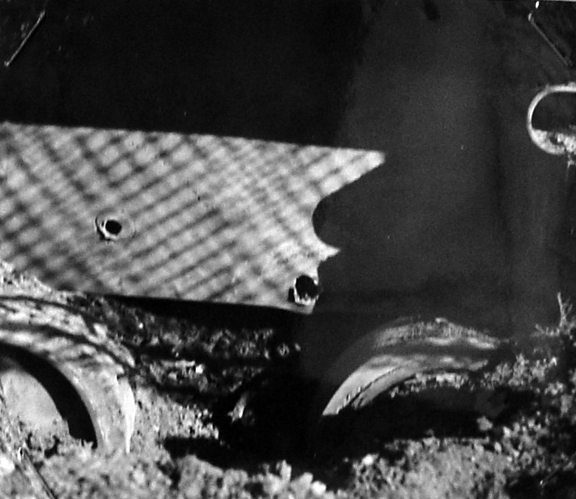 A 3/4 inch (20 mm) spaced armour plate with a stand-off distance of 12 inches (30 cm) or less actually enhanced the shaped charge’s effect by optimizing its stand-off distance. Spaced armoured backed with 12 inches of cork or rock wool did not work. Spaced armour filled with 12 inches of sand usually worked, but added 5 to 9 tons to the vehicle’s weight. 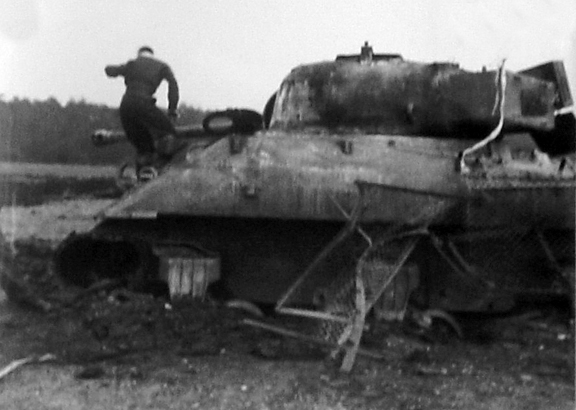 A Panzerfaust is fired at a derelict Sherman, note the considerable back-blast. Both angled plates and spikes showed promise against small rotating shaped charge shells, but not against heavy non-rotating charges such as the Panzerfaust 60 or the Stielgranate 41 round used with the 3.7 cm PaK 36. 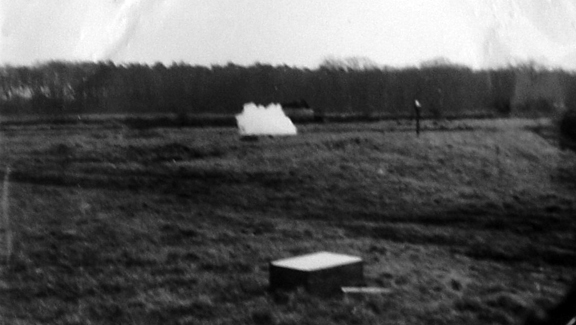 Mounting mesh screens worked to some extent with the relatively low velocity Panzerfaust (klein), which had a kinetic energy of only 440 ft/lbs. They failed to stop a Panzerfaust 60 with a KE of 3500 ft/lbs. It was not possible to devise a screen strong enough to stop the Panzerfaust 60, but gentle enough to prevent it from detonating. More often it did not. Even so both the large and small Panzerfaust penetrated the tank’s side. Using small charges to disrupt the jet- a forerunner of reactive armour – was also considered. It was deemed “wholly impracticable” – as it was impossible at the time to make the charges sensitive enough to detonate in time to defeat the shaped charge, but not so sensitive that they would not be set off by chance blows or near-by explosions. The British obtained similar results in trials carried out in Normandy and Italy. A Panzerfaust could burn through the frontal armour of a Churchill (175mm), and even with mesh screens mounted, had no trouble penetrating its 79 mm side armour. 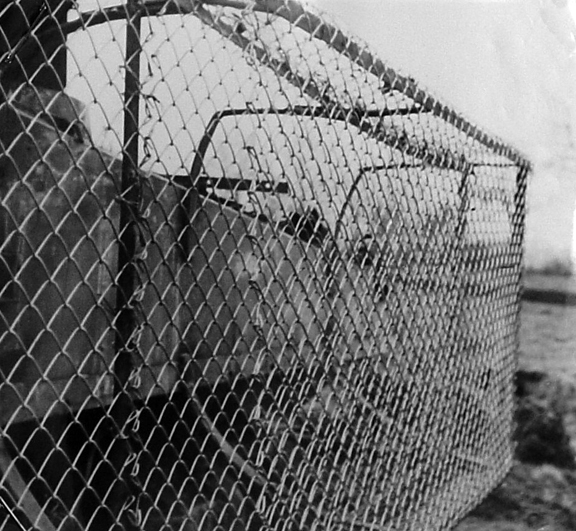 The Germans also used mesh screens, the so-called Thoma Schürtzen, but their main intent was to protect the tank’s undercarriage from anti-tank rifle fire. The above illustrations come a report prepared Major A.G. Sangster, the AFV Technical Development Officer at HQ First Canadian Army. [i].Rottman G.L, Panzerfaust and Panzerschrek, pp 18-19,21, 28.